If you’re going to be researching using a variety of computers, perhaps a better option is to use an online genealogical database rather than a genealogical database stored on one computer. One full-featured online genealogical database is Ancestry.com. Not only can you enter genealogical information, but you can also upload media files and integrate your data with the content found on the Ancestry.com subscription site through the Hints function. 1Point your web browser to Ancestry.com. The Ancestry.com home page appears. 2In the upper-left corner of the home page, click the Family Trees button on the menu bar to open the Family Trees page. A new page appears labeled Start your tree. Organize facts. Find answers. 3Near the top of the page, enter your first name and last name, select your gender, and click Start Your Tree. The resulting page shows a three-generation Pedigree chart with you as the first person on the left side. Note the helpful tips along the right side of the chart. 4Add the name of a family member to the tree by clicking the Add Spouse link, the Add Father link, or the Add Mother link. In the pop-over box that appears, enter the first and middle names, maiden (or last) name, gender, birth date, birthplace, and, if applicable, death date and death place. A pop-over box is similar to a dialog box except that you must complete its fields and click a button to make it disappear. When you begin to enter a location in the Birthplace field, a list of potential matching locations appears beneath the field. You can select from the list to enter the information more quickly. You can also use this list to standardize the location that makes searches easier in the Ancestry.com database. The Save and Build Your Family Tree pop-over box appears. To save the family tree, complete all of the fields on the form, including the tree name and your first name, last name, and e-mail address. You can also choose to allow others to view the tree by selecting the check box. 6Click the Save My Tree button. If your e-mail address matches a registered user of Ancestry.com, the Provide a Password page appears. Type your existing password to continue. If your e-mail address is new to the site, Ancestry.com automatically registers you and gives you a default user name and password. To change the default user name and password (randomly assigned values that you aren’t likely to remember), click the link. The family tree you just created is displayed. 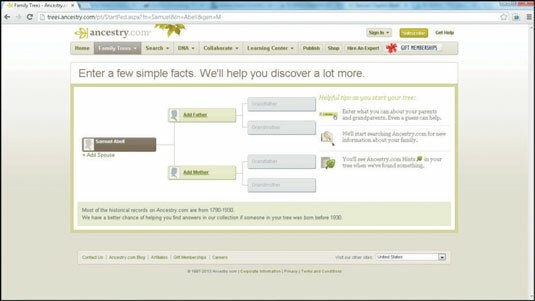 A pop-up box may also appear describing the Ancestry Hints feature. After reading it, click the X in the upper-right corner. If you want to see the hints, click View Hints. In this case, click the X to continue to the Pedigree chart. 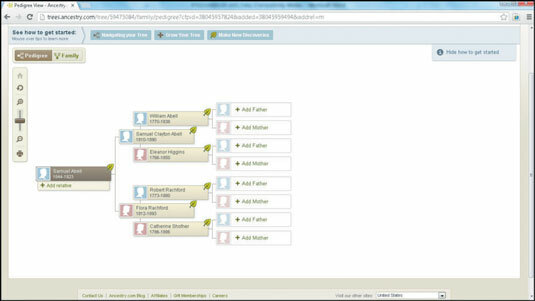 7Add information about other family members by clicking the Add Father, Add Mother, or Add Relative links. Clicking any of these links opens a pop-over box. Enter the individual’s first name, middle name, last name, gender, birth date, birthplace, death date, and death place. Click the Save button when you’re finished. 8The Pedigree page is shown again with the names of the new family members. If you see the green shaky leaf symbol, Ancestry.com has found a hint, meaning that Ancestry.com has searched its databases and thinks it has found further information on that particular individual. Sometimes the hint applies to the person and sometimes it doesn’t. 9Click the leaf symbol to see the hint. When you finish reading the hint, click the gray Return to Tree box. Not every individual triggers a hint, so don’t be concerned if you don’t see one. If you follow a hint that leads to part of the paid subscription database, the site prompts you to subscribe to the Ancestry.com site. As time allows, add more generations to your family tree.